The day began with an early morning tour of the site by Nick Card, the site director, re-acquainting old hands with the layout and thrilling the new diggers, few of whom will have seen anything as magnificent. It was instantly clear that the site has survived the winter well, thanks to its protective coating of black plastic, which had finally been removed late on Day One. This immediately sparked off a lively on-site debate. The preferred plastic at the Ness is plain and black, but some archaeologists favour a woven plastic material, which, it is claimed, lets the site “breathe”. However, its detractors claim that it lets weed seeds penetrate through the woven gaps, presenting diggers, on the next year, with hours of gardening and weed removal before cleaning can begin. Whatever the merits of the various arguments, it is clear that the excavation site is remarkably clean, and weed-free, this year and ready to give up more of its secrets. Much of the day was taken up with the relatively mundane task of cleaning back the surfaces. In the highly-complex Structure Eight, Dave and his team have nicely defined floor deposits and are preparing to remove collapsed material from the north-east corner. A wider aim for this year is to discover just how big this structure is, despite it being cut into by the later Structure Ten. A tiny corner of walling has been discovered, which may give a clue, and the eventual dimensions could be as large as 20 metres long by 10 metres wide. Remember, this extraordinary building appears to have been roofed with stone tiles. 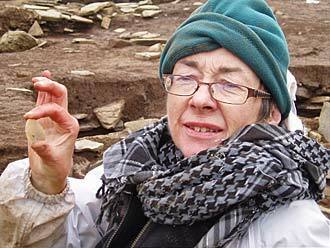 However, by late afternoon, Structure Eight was maintaining its reputation for nice finds – while cleaning at the southern end, Jill found a lovely little flint scraper and Ray also found a large piece of worked flint. 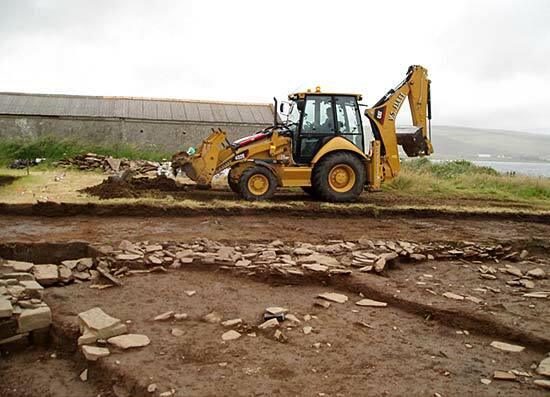 In Structure Twelve, discovered last year, Owen’s team are also cleaning and preparing to reduce the midden material, which fills the interior area of the structure. The truly monumental Structure Ten is also being cleaned, and supervisor, Antonia, is defining areas at the edge of the trench, which have been robbed-out in antiquity. This is an essential preparation to finding the entrance to the structure. In the north-east area of Structure Ten, Adam made a curious find. Recognising it instantly by its weight, in relation to size, he found he was holding a small piece of galena, or lead ore. Why this is present is a puzzle. 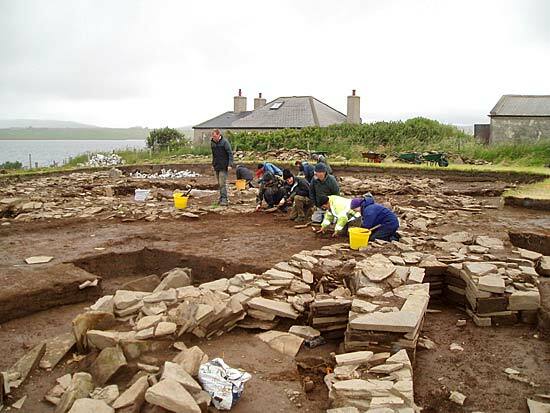 Lead deposits certainly exist in Orkney and have been mined in the past. Could this find be linked to the painted stones from several of the Ness structures? Grind down galena and you have whiteish pigment, which could have been used in conjunction with the red, yellows and browns already discovered and which have been linked to iron ores. Tomorrow sees the first arrival of visitors to the site. Free tours take place, on weekdays, at 11am and 3pm. Everyone is welcome to visit the Ness, undoubtedly the most amazing Neolithic site in Northern Europe. Greetings from a windswept, and now wet, Ness of Brodgar. 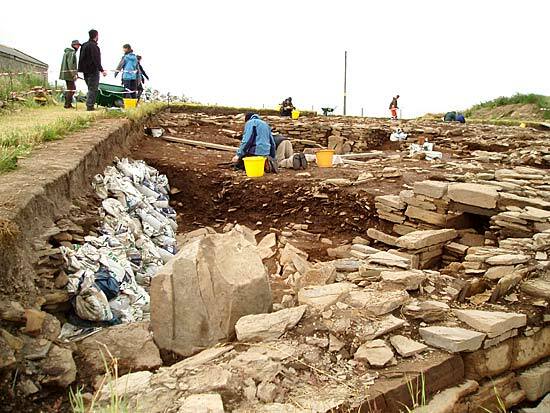 Today saw the end of the backbreaking removal of countless sandbags and stones that supported, and protected, the archaeology against the Orcadian winter and the commencement of the trowelling off of the top few millimetres of surface, to refresh the deposits flattened and polished by the polythene sheeting. This is my fifth year on site as a volunteer and the archaeology here still amazes me. I hope that I will have the privilege of working here for many years to come.